Are you struggling to get visibility on Facebook? Wondering how a Facebook group could help? In this article, you’ll learn how to use a Facebook group to foster engagement and drive the meaningful interactions favored by Facebook’s news feed algorithm. Why Revisit Facebook Groups for Business? How are these “meaningful social interactions” being measured? A Facebook Help Center article dives into the types of posts you may see first when scrolling through your news feed: posts similar to those you’ve interacted with through likes, comments, and shares; person-to-person interactions; and exchanges that reflect time and care. People tend to join groups around topics they’re passionate about and subjects they’re interested in, and passion and interest are definitely catalysts for engagement. Here are four tips and tactics to help you start driving meaningful social interactions in your Facebook group. People are much more willing to share their personal thoughts, ideas, and work (and to engage genuinely) when they feel safe. Facebook groups are great places to foster a safe space. To do this, create a closed group; use questions to pre-screen new members; and monitor the discussion to weed out spam, bullying, or other types of posts that aren’t contributing positively to the group experience. 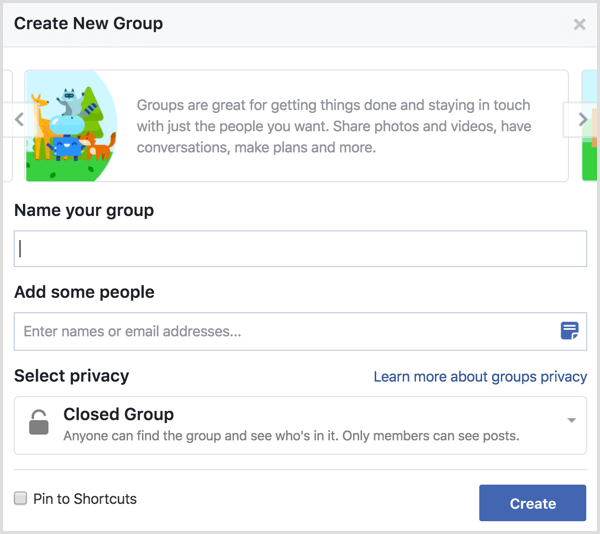 Facebook groups can be open, closed, or secret. An open group is public and anyone can join and immediately see all of the posts and begin engaging. A secret group won’t show up in search and the only way for someone to join is to be personally invited by another group member. A closed group can be discovered through Facebook search, but group admins must approve requests to join. 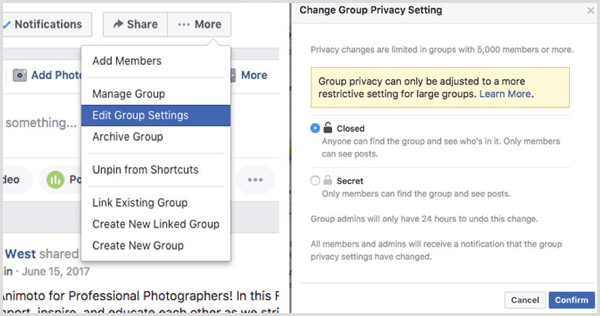 To set the privacy of your group, click the …More button at the top of your group and select Edit Group Settings. Under Privacy, click Change Privacy Settings. Note that if your group has 5,000 members, you can only go from open to closed or secret, or closed to secret, to protect the privacy of your members. Making a closed or secret group open to the public wouldn’t be fair to group members. Not sure whether someone’s a good fit for your closed group? You can ask potential group members questions before they join to get to know a little more about them and why they’re interested in joining. Here’s how to set that up. Go to your privacy settings (as discussed above) and find the section for Membership Requests. There, click Ask Questions to add questions to the moderation process. Once you’ve admitted people to a closed group, you reserve the right to remove them if they’re not adhering to community guidelines. You can remove people under the Members section of your group. Just click the three dots icon next to the member you want to remove and select Remove User. You can also mute members here or add them as moderators or admins. If you see an unsavory post, you can remove the post and user directly from the post. 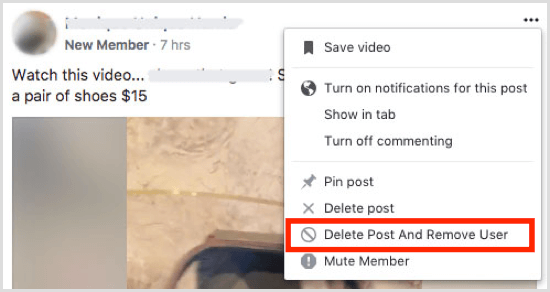 If you select this option, you can remove all of the posts from the group member within a specified time frame, as well as automatically decline all membership requests from people added by the member. You’re the cement that holds the group together and your presence ultimately ensures that the community grows and thrives. Master photographer and educator Sue Bryce runs a successful and active group for her business, Sue Bryce Education, with more than 47K members. She says, “I’ve worked hard over the last five years to keep a community feeling. I do that by being in the group every day myself.” When Sue can’t be in the group, a team of supporters and administrators helps keep the conversation going. The first step to being present is to let members know who you are and that you’re there to help. One of the best ways to do this is to introduce yourself to new members with a welcome message. This is easy to do. When you add new members to your group, you’ll see a message on the right side of the main group page that says, “You have X new members this week. Write a post to welcome them.” Click the Write Post button, and Facebook will pre-populate a new post for you with all of the new members tagged. Feel free to publish the post as is or personalize the message to share more pertinent information about your group. Note that you can only tag 99 new people at a time. If you add more than 99 members in a week, you won’t be able to tag them into the post; however, you can still share a weekly welcome message to let new members know you’re glad to have them. Pin important information to the top of the group such as your introduction, rules and guidelines, or posts you don’t want new members to miss. A pinned post will stick to the very top of your group feed, regardless of whether you or other members make posts. To pin a post that’s been published, click the three dots icon in the upper-right corner of the post and select Pin Post. Part of your job as a group admin is to encourage people to engage. To do this, respond to questions, chime in on posts, and share questions or discussion prompts. Regular challenges not only help drive engagement, but they also keep group members coming back to find out what’s new, take part, learn, and grow. Not sure how to get the ball rolling? Start by inviting already engaged fans, friends, or customers to your group. Get creative in using other marketing channels to drive people to your Facebook group. Link back to your community from relevant blog posts and your main Facebook business page, and even send emails letting customers know they can join your community on Facebook for inspiration, feedback, and advice. Using video can be a nice way to encourage even more engagement in your group. You can use both live and recorded video in groups. In a recent blog post, Facebook’s Adam Mosseri shared that “live videos on average get six times as many interactions as regular videos.” As a result, Facebook Live can be a good way to boost engagement in your groups. This is something that both Mari Smith and Sue Bryce do regularly. For instance, Sue goes live every Tuesday at noon with a new subject to teach her group. The consistency of this Facebook Live broadcast has led to amazing growth in engagement. 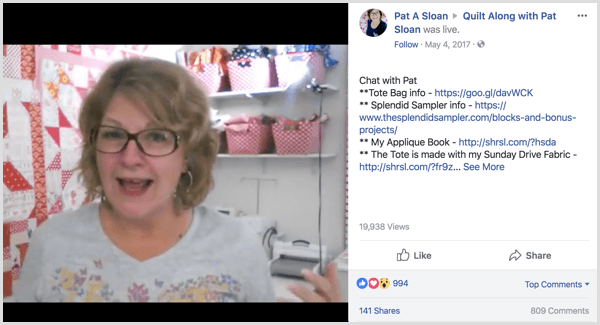 And you can also use Facebook Live as an opportunity to bring the high level of engagement in your groups out into the public on your main Facebook page. For example, you could go live on your main page and share the live stream to your group. Not only is it an effective way to send more engaged customers to your groups, but you also may discover group members among the most engaged commenters. Recorded video is also a nice tool for a couple of reasons. For one, video allows you to showcase yourself more authentically than text alone. Get in front of the camera and introduce yourself and your team to your community. Video also stands out in the news feed, capturing group members’ attention as they scroll through other content on Facebook. 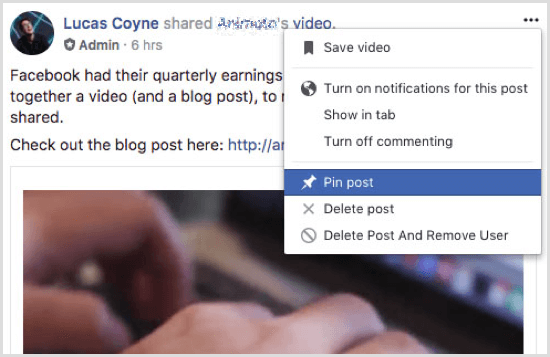 And group engagement will also help boost the position of your videos in the news feed, as Facebook continues to focus more on meaningful social interactions. In addition to leaving the time and space for others to contribute, here are a few things you can do to shine the spotlight on group members. As you get to know your community, you’ll also be able to engage them directly. Tag them in conversations you think they’d be interested in or could contribute to. If you have a group member who’s a real estate appraiser, you might tag them in a conversation around that topic so they can chime in. This “hot seat” concept is nice because it not only spotlights individual members from the community, but also benefits the entire group. Everyone can learn tips and best practices from Mari’s critiques that they can apply to their own website or page. In this way, the community can learn from each other. Speaking of letting the members learn from each other, creating content around unique perspectives, out-of-the-box ideas, and good work shared in the group is another fun way to spotlight group members. Seeing other community members showcased is also an incentive for members to continue to share their own perspectives, ideas, and work. What types of conversations do you envision happening in your group? What types of things do you expect group members to share? Think of how you might repurpose group conversations to create engaging content to share back to the group. Creating a Facebook group is simple. Just head over to facebook.com/groups and click Create Group. Then name your group, add some people (you need to add at least one friend to create your group), and select your privacy settings. I recommend that you select Closed Group at this stage. Once you click Create, choose an icon that represents your group. If you don’t find an icon you like, feel free to skip this step. Your group is now created! At the top of the page, you can upload a cover photo to personalize your group. There are also lots of fun special features for group admins to explore, including Group Insights, post scheduling, member leaderboards, and more. Your group will be created with your personal Facebook page, but you can easily link it to your business page. Just head over to your Facebook page and select Groups on the left. Then click Link Your Group and click to link your newly created group. Finally, it’s important to remember that communities inevitably create themselves. As a result, you’ll have to grow and evolve based on what’s resonating with people and the direction they’re heading on their own. Of course, you can use challenges, shared topical content, and discussion prompts to guide the general direction and reel folks in if they get off topic. But the ultimate meaningful social interactions will come from the conversations that stem from the passions of the people in your group. Curious what your community wants more of? Less of? Ask them with a poll! To set up a poll on your Facebook page, click the Poll button in the same place you’d go to share a photo or write a new post. Ask what people want to see, list some ideas to vote on, or even open up the floor for group members to add their own ideas! What do you think? 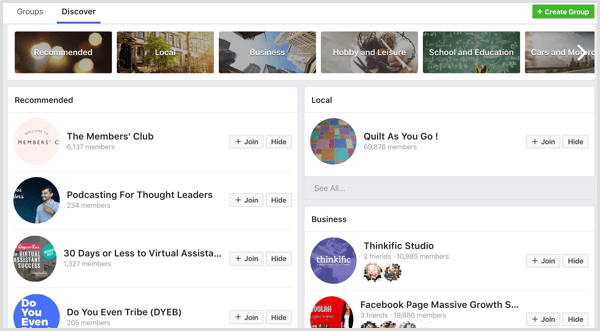 Are you using Facebook groups for your business? If so, what tactics have you had success with? 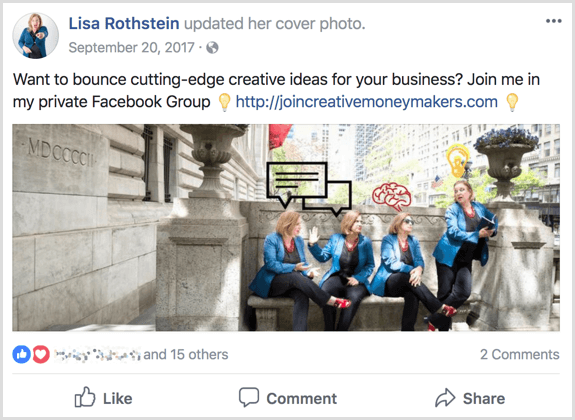 If not, what type of Facebook group do you envision creating for your business? Please share your thoughts in the comments.